Inflatable Seal Integrity and Functionality certified! Sealing Projex Ltd have recently invested in improved AC FT (Accelerated Cycle Fatigue Test) equipment. In order to further push the boundaries of quality control for existing ISO-FLATE ™ inflatable seals, and generate further real world data on application suitability for new designs. This bespoke equipment now allows us to test up to 10 bar internal pressure, (and seal volume dependant) simulate up to 10,000 cycles per day in order to asses’ seals ability to deal with the demands of the intended application. 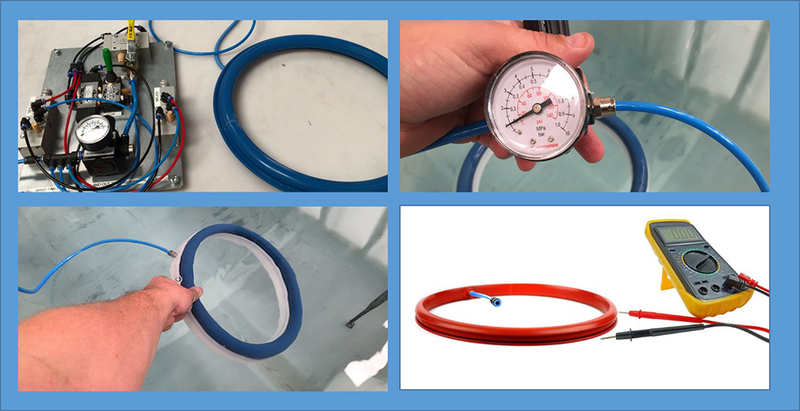 Used in conjunction with our ability to create test rigs that mimic the seal gap, pressure and allowable leakage rates of the most stringent environments around, we are ideally suited to assist you in selecting an inflatable seal that will be fit for purpose, or creating one where none exists! Where client and usage demands, we can schedule a test programme and certify batch specific for continued reassurance. Nitrogen/hydrogen containment leak test of seal / door interface passed at 1.33 x 10-3 mbar ltrs per sec. Should you have the need of a responsive, knowledgeable team in supporting you with a new seal design, or eradicating issues with an existing seal, feel free to contact us at any time. https://www.sealingprojex.com/wp-content/uploads/2016/03/Inflatable-seal-immersion-test.jpg 768 1024 Paul O'Connell https://www.sealingprojex.com/wp-content/uploads/2015/12/SP-Logo-300.jpg Paul O'Connell2016-03-23 13:29:282016-03-30 14:53:01Integrity and Functionality, certified!